London (United Kingdom) – March 20, 2017 (travelindex.com) – Alain St.Ange is the perfect candidate for Secretary General of the United Nations World Tourism Organisation, President of ICCO Maxim Behar says. ICCO is the largest Public Relations community on the world having 48 countries from all continents with more than 3000 firms. “I know Alain St.Ange as perfect professional who understands every single small detail in the tourism business, but also has a wide vision on the whole world and knows how to make this business much more efficient and result oriented. I fully agree with Alain that the tourism business must be much more united and to work for better environment, to emphasize on cultural heritage and specialized travels. But also – Alain is a great personality, he united not only businesses and countries, he united people and ideas and this is one of his greatest advantages”, Behar said. 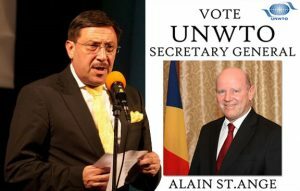 Alain St.Ange, the Seychelles Candidate for the position of Secretary General of the UNWTO said he was thrilled by the latest endorsement. Mr Maxime Behar, the President of ICCO is really pleasing. They are the largest Public Relations Community of the World and are based in Bulgaria. As the election date gets closer such endorsements are important showing clearly that the world of tourism is coming out and speaking up as the new Secretary General of the UNWTO will impact their livelihood and industry when he takes office. Support for the Seychelles Candidate St.Ange continues to grow by the day. The Seychelles Candidate has already received Letters of Endorsement from President Danny Faure of the Seychelles, from Sir James Mancham, Seychelles founding President who wrote an open letter about his support for the Seychelles St.Ange bid for the United Nations just a week before he passed away, the Indian Ocean Vanilla Islands Organisation (Comoros, Mayotte, Madagascar, Mauritius, Reunion and Seychelles), the Africa Ports Association of Eastern and Southern Africa (PMAESA), Tanzania Society of Travel Agents (TASOTA), the Seychelles Hospitality and Tourism Association (SHTA), Fred W. Finn, the World’s Most Travelled Person Guinness World Records, the Seychelles Hindu Kovil Sangam Association, India’s important N.R.I. Welfare Society, the Creole Travel Services of Seychelles and the Association of Tourism Professionals of Mauritius (ATP), Eden Island Seychelles, Bea Broda the known Producer/Writer/Host/Speaker from the Americas who wrote: One candidate that stands out to me is Alain St.Ange, the former Minister of Tourism of Seychelles. In the seven years that I have been familiar with his work, I have witnessed the extraordinary dedication, enthusiasm and visionary brilliance that resulted in his enormous success in this role. St.Ange took a relatively small island nation in the middle of the Indian Ocean and created a way to bring Seychelles to the forefront of global attention with the enactment of the Carnaval International de Victoria. This international event experienced six years of success, not only bringing interest and tourism to the nation, but proudly unifying all of the people who live there towards a common goal. In addition, St.Ange was a founder of the Vanilla Islands of the Indian Ocean, a consortium designed to combine the strengths of the islands located in the Indian Ocean to present a strong front in a competitive market. He has worked ceaselessly in the direction of the absolute success of those issues to which he cheerfully commits his time, and I would personally like to see someone with his considerable vision, dedication and creativity take the helm of an organization as influential to tourism as UNWTO, and Theresa St.John, the reputed Travel Writer who said “It’s not often that I have the chance to interact with someone who speaks so passionately about travel, tourism, and the people behind the ‘business of it’, the Hon Xavier-Luc Duval, former Deputy Prime Minister of Mauritius who had responsibility for Tourism and also a past president of the Indian Ocean Vanilla Islands, now Leader of the Opposition in Mauritius, the Seychelles Chamber of Commerce and Industry and Gilbert Lamory, the Vice President responsible for Development for GIHP (Groupement pour l’insertion des personnes Handicapees Physiques) of France, Johnny Rohregger, the King of Travel, Hardy Lucas, a former political colleague of the Seychelles Candidate, Germany’s Thomas Cook Group Airlines Condor Flugdienst GmbH, a leading European Leisure Airlines Group said:- Alain St.Ange is in the top league by global comparison, and wish him all the best for his candidacy for the UNWTO and Wolfgang H. Thome of the Aviation, Tourism & Conservation News from Eastern Africa and the Indian Ocean Islands who wrote St.Ange is My Man for the UNWTO Top Job. Today it is Maxim Behar, the President of the ICCO, the largest Public Relations community on the world being in 48 countries who says:- I know Alain St.Ange as perfect professional who understands every single small detail in the tourism business, but also has a wide vision on the whole world and knows how to make this business much more efficient and result oriented.